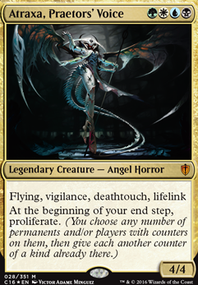 Hi there, A couple of suggestions,first I think you lack some protection for your creatures,Atraxa as well as Kalonian Hydra and to a lesser extent Corpsejack Menace are lightningrods for removal and I think Shalai alone isn't enough to keep these creatures safe so my first suggestions would be good old Lightning Greaves and Swiftfoot Boots . 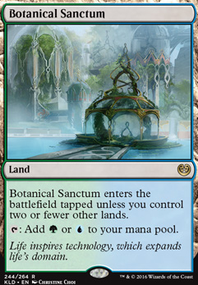 Next is your mana seems skewed towards black,and as I see from the graph you lack some white and blue sources so maybe change The Golgari Signet to an Azorius one and change one swamp for an Island. Last point would be cards to cut: Cathars' Crusade I think this isn't the deck for this card as you have just 2 creatures that actively want to do damage(Hydra and Thrummingbird) the rest are most for their etb or static abillity Leyline of Sanctity I don't know how your meta looks like but this seems like overkill in a multiplayer game at least where I play targeted discard and burn into the face is rare(if you play many 1vs.1 games I would look differently at the card. Hello, I also have some suggestions that you might like. I play my versions of the deck a bit more with artifacts and hydren. Eternity Vessel -This one is incredible, especially if you double the charge counter two or three times. Riptide Replicator - So you can bring a certain type of creature, which is still partly really big on the field, EACH ROUND. Transmogrifying Wand - A great interactive tool, especially in simic. 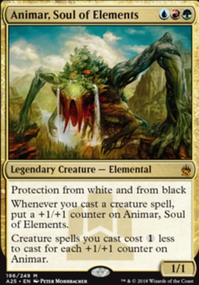 Colossus of Akros - Need something to mana, but then indestructible and trample are already a challenge for your opponents. 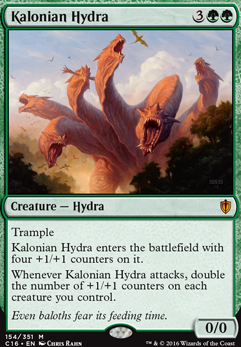 Kalonian Hydra - Trample and she doubles herself with every attack. Managorger Hydra - Perfect in multiplayer rounds, but also very strong. Primordial Hydra - Need no further comment. 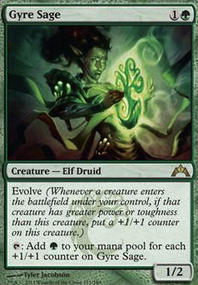 Crowned Ceratok / Tuskguard Captain - Trampling for everyone, what more could you want. 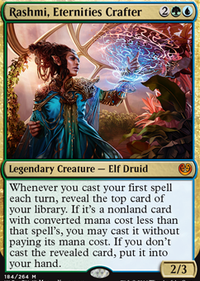 Chromatic Sphere seems like a wasted card space tbh. You don't need the color fixing, and the cantrip is mediocre here. It's really only necessary when playing 2+ colors with Tron lands. Managorger Hydra , and Kalonian Hydra come to mind. 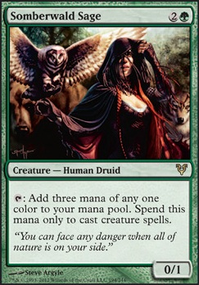 Crystalline Crawler and Cathars' Crusade with Marath, Will of the Wild 's ability to generate tokens seems like something you could want, other than that Illusionist's Bracers is just goodstuff to put on Marath.... Maybe a Forgotten Ancient or Kalonian Hydra depending on what you really want out of the deck. 1) Have Heroes' Bane , Corpsejack Menace , and Kalonian Hydra on the field 2) Pay and make Heroes' Bane a 12/12 because Corpsejack doubles the amount of +1/+1 you would put on him 3) Do that again, making him a 46/46 for the same reasons as before 4) Swing with Kalonian Hydra, Bane is now a 138/138 because Kalonian doubles Bane's counters and Corpsejack doubles the amount you would put on him 5) During your second main-phase, sac him to Jarad, each opponent loses life equal to the sacrificed creature's toughness. The whole deal only costs 11 mana if you already have the creatures on the field. If you play heavy ramp you can pull it off turn 9 or 10, even earlier if you're lucky. None of the cards are super expensive, Kalonian Hydra is $6 and the rest are under .60 so everything should be more than affordable if you're low on spending money. There's also a couple other cards you could add that just make sense in Muldrotha. 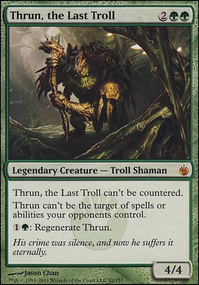 Secrets of the Dead and Deadbridge Chant are necessary additions for Muldrotha. That also leaves room for another win con because of the color scheme; Exquisite Blood and Sanguine Blood. 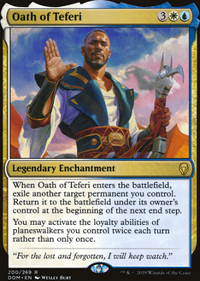 It's a bit pricier but it's a solid garuntee for a victory if you can manage to put them both on the field with something like Zulaport Cutthroat .